Valentine Warner, chef, on his box of fishing flies. VW For a start, fishing is my meditation. It’s a place where I can ignore the world. In fact it takes me to the point of irresponsibility where I actually switch off my phone. It’s a beautiful discipline that also takes you into beautiful places to catch what are to me, the most beautiful creatures. I love photographing fish, I love drawing them, I love eating them but I love looking at them ultimately. The flies are very conceptual things in a way. There are lots of variations on them. All fly tyers will tie a different variation of the same insect. Some of those can be really quite abstract. It’s all based around trickery. You’re using cotton and animal hair and all these things to create something that imitates life and they’re extraordinary. 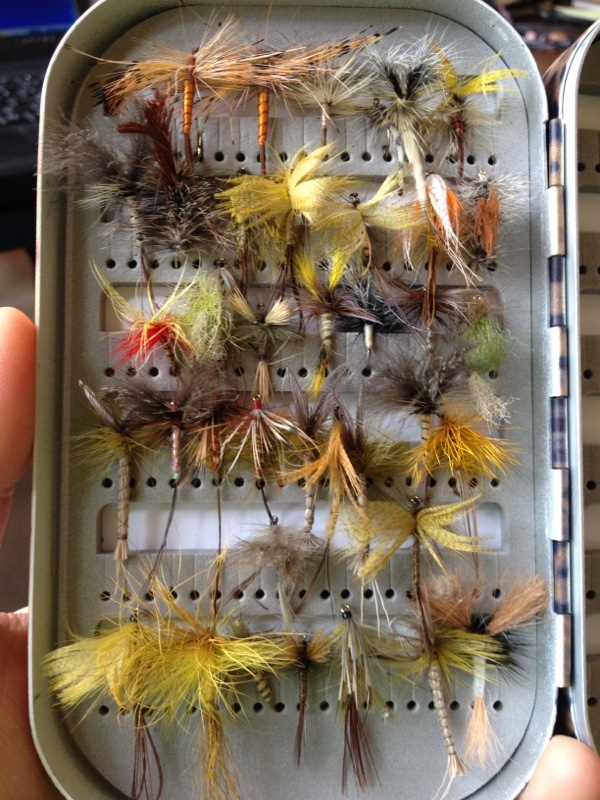 They’re so beautiful that often I lie in the bath, if it’s a long bath, and I’ll take my fly box. It’s probably not a great idea to be naked and playing with these things – but I’ll regiment them and have a really good look at them. GB Have you ever tried making your own? VW No, but wherever I am, in Ireland or France or America, I’ll never pass up an opportunity to walk into a fishing shop. I’m like a five-year-old in a sweet shop. I’ll always walk away with a small paper bag or plastic box full of flies. GB Do you have a preference for particularly fancy or simple ones? VW No. The box pictured is full of mayflies and some are very realistic, with little wings made of bent-over feather or plaited tails. Others are a kind of abbreviation, a little mass of cotton and hair. If you see 50 mayflies in a shop there will be some you don’t like and others that you want to give a go, partly through being realistic but mainly because of their artistic strength. GB Does the artistic prowess correlate with how successful they are at catching fish? VW There’s a very old-fashioned mayfly called French Partridge which is absolutely deadly and my favourite. Then there’s an American one I’ve got which is stunningly made and works just as well, but you sit on the river bank and depending on your mood you’ll take one over another. The mayfly season is very short and it’s called duffers week because it’s so easy to catch fish. But when they’ve really been gorging themselves they’ll suddenly become really fussy about which mayfly they’ll take. So you have to play around a little bit and I love that. GB Does it never bother you that you’re using these lovely things to kill fish? VW No. If I’ve got a lot of fish in the freezer I won’t kill any, I’ll put them back. I do eat a lot of them. I love curing fish. But I’m never greedy and I don’t kill wild fish, I just kill stocked fish. GB Have you ever been injured by a fly? They look like such fluffy, pretty things and yet fishing hooks are terrifying. VW Fishing in a strong wind, I’ve had many stuck in my scalp. A friend’s father got a giant salmon hook stuck right through his eyebrow and he was in the middle of nowhere, so he fished on all day with a stream of dried blood down the side of his face and the enormous hook in his eyebrow. It was quite funny when a bus load of Japanese tourists got out of their bus on a bridge over the river and saw this guy who would go to any lengths not to ruin a good day’s fishing. GB Is fishing quite a macho sport generally? VW No, I was taught to fish by a woman, Pamela Egremont, who lived in Cockermouth Castle on the Derwent The two people who taught me most of what I know were an American cowboy in Montana and Pamela Egremont. GB Your style of cooking seems to go right back to our primal instincts. VW We have to understand that we are of this land. As we’ve grown away from nature and become less rural and more urban, we’re no longer required to know what grows immediately around us. When we’re no longer interacting with nature then how is it possible to go on caring for it? How do we know that we won’t need that information again one day? I don’t expect people to come back from a long day’s work and go foraging but it’s better to know when you’re walking past a horse radish or standing next to a hazelnut bush. You have more options when you know more about your surroundings. GB Do you think it’s decadent to make fancy pieces of sushi that almost don’t look like food? VW That’s a bad example. Japanese food very much reflects nature. It’s an environment on a plate. Food should look good. You eat it with your eye first, as they say, but ultimately it’s the taste that’s the point. Middle-Eastern beans that are stewed until they go an unappealing grey, taste much better. It can work both ways. GB Do you have anything in your life that’s purely decorative? Didn’t you study art? VW Yes and my house is full of my own pictures. I buy pictures and clothes because I like them, but it’s not something I pursue with constant intent to have more. One of the things that pisses me off about modern life is this constant need to acquire. I’ve got to a stage of my life where I like to get rid of things. VW It can be a moment of compassion. It can be the natural world. I think that you can’t copy the brilliance of nature, so nothing humans make is quite as good. Even though what I’ve chosen is a copy of nature, there’s something about the wilderness that’s overwhelming to the point it brings a tear to my eye.